Supporting the Youth in our Community. Our Rotary Club actively supports the youth of our community with the aim of developing their skills through a number of events and initiatives. · Every year we sponsor students to attend the Rotary Youth Leadership Award (RYLA) which is a residential course with students both from this country and internationally. It is a tremendous experience for them to meet and work with others and use their initiative on projects and life skills. 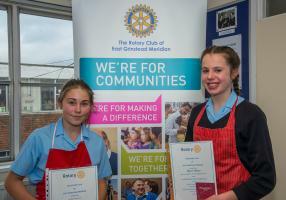 · For many years we have organised the local heats of the Rotary Young Chef competition where students from our senior schools cook a 2 course meal for professional judges. The standard is always extremely high and the winner goes on, with our support, to represent our area in the District and hopefully National Finals. 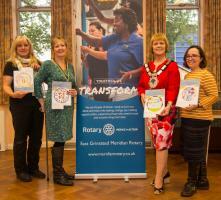 · Similarly we also support entries into The Rotary Young Photographers competition. · We are aiming to support local primary schools with grants to enable the purchase of books and other items otherwise unavailable to them. · For the past few years we have supported the students of Imberhorne School in the Young Enterprise competition where the students organise their own trading company and products to sell. · A number of our members also give their time to provide mentoring to young people to help with career development. · We also work closely with the local Scout Groups and Playgroups providing donations and support. We respond as and when asked to requests from individual young people. We are extremely active in the support of the youth in our community as they are the future. Why not come and find out more? 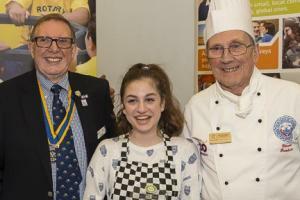 Six students from Imberhorne and Sackville Schools met at Sackville to cook a two course meal in the opening round of the annual Rotary sponsored competition. On Friday 9th December 2011 nine young people from Imberhorne, Sackville and Notre Dame Schools took part in the Young Chef club competition. Judging was carried out by Club President John Ellis and chef Mark Budd from Alexander House. This year's competition was held again at Imberhorne School. 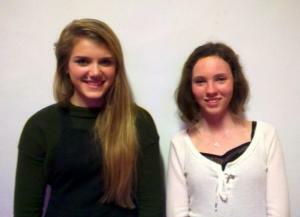 Winners are Amber Lane (left) from Lingfield Notre Dame who came first with Simone Ulyate from Imberhorne coming a close second.